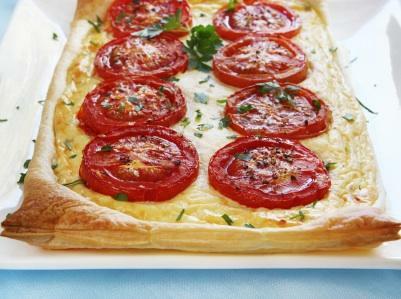 Discover even more recipes using puff pastry. Using frozen dough for puff pastry appetizer recipes makes for quick and simple ways to wow your guests and not spend a lot of time in the kitchen. Think of puff pastry dough as an excellent background for melted cheeses, sauteed leeks or onions, tapenade, pesto, or other toppings that taste fantastic when paired with buttery layers of pastry. To help you get an idea of how versatile puff pastry dough is, here are a few recipes to get your imagination buzzing. If you want an extra challenge don't be afraid to try making your own puff dough, but if you are short on time, grab some from your local supermarket freezer section and start cooking! Stir pecans, butter and salt together until combined. Roll puff pastry dough out on a lightly floured surface into a 14-inch by 12-inch rectangle. Cut out 40 circles with a small, round cookie cutter. With a spoon, scoop a 1/2 teaspoon-sized mound of the cheese filling in between the top and bottom layers of each puff round. Bake on a parchment lined baking sheet until the cheese just begins to melt and the appetizers are warm, about 2 to 3 minutes. Sprinkle top of puff rounds with salt and pepper to taste and serve warm. Butter a medium-sized baking sheet. Wash leek thoroughly. Slice into very thin rounds. Add butter to a skillet and melt over medium-high until foam is gone. Sauté leek, stirring often, until light golden and soft. Add water and scrape any brown bits on the bottom of the pan. Cook until water has evaporated. Stir in lemon thyme and lemon zest, and cook until leek is more golden brown and set aside. Cut a sheet of puff pastry approximately 10-inches x 3-inches. Halve this pastry strip crosswise and place puff dough onto a baking sheet lined with parchment paper. With a fork, prick the pastry so it doesn't puff up too high and bake until it is a nice golden color, about 10 to 12 minutes. Transfer each pastry to a plate and press in the center to form a pocket for the goat cheese and leeks. Gently spread the goat cheese in the middle of the pastry taking care not to tear the tart shell. Top with the leek mixture and garnish with fresh lemon thyme. Preheat oven to 400 degrees F. Line baking sheets with parchment paper. Sprinkle about 1/3 cup of cheese on your countertop and cover it with a puff pastry sheet. Sprinkle another 1/3 cup of cheese evenly over pastry sheet and roll it into a 10-inch square. Fold the two opposite sides of the square so the sides meet in the center. Fold again so the same sides of the pastry meet in center. Dip the cut sides of each piece in cheese and arrange, cut side down, on baking sheet. Repeat with three remaining pastry sheets. Bake about 12 minutes. Flip the palmiers over and bake until golden on bottom, 6 more minutes. Transfer to a rack to cool completely before serving. For each of these appetizer recipes, the fillings can be switched around to include different types of cheese, nuts, herbs or citrus zest. Once you have the hang of the technique try topping little puff pastry rounds with a simple tapenade or a pesto and a thin sliver of cheese for a very quick and simple appetizer. Or, roll the dough into a larger sheet and create a tart with local, seasonal vegetables such as tomatoes, zucchini, potatoes or mushrooms.